These newlyweds had a dream of a theme park-inspired wedding. Photo by Jonathan Rodriguez/Sublime Image Photography. Have you ever dreamed of having a Disney-inspired wedding? 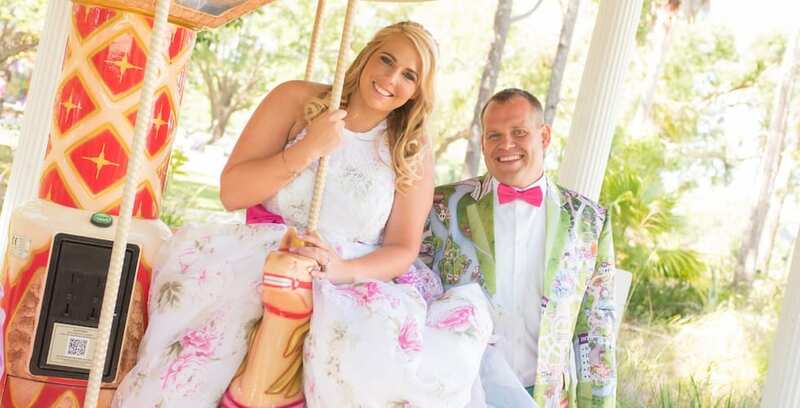 Local couple Ben and Kylie Story certainly did, and made their dreams come true by hosting a theme park-lover’s dream wedding at The Ever After Estate this past week. 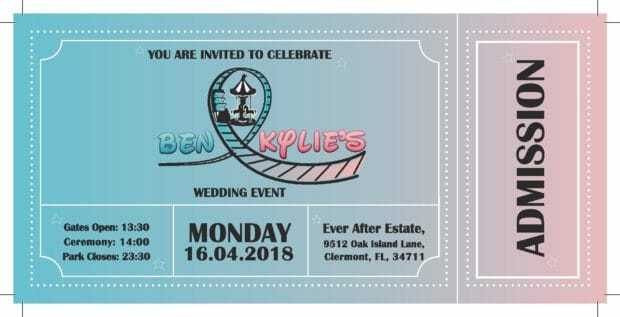 The wedding invitations were styled to look like theme park tickets. Image courtesy of Ben Story. The ever-popular ball pit room inside The Ever After Estate. Photo by Jonathan Rodriguez/Sublime Image Photography. The wedding was hosted at The Ever After Estate, a 62-acre movie-themed estate and vacation home in Clermont, Fla. This location boasts various amenities including 12 bedrooms, 10 bathrooms, 2 1/2 kitchens, a ball pit room, four arcades, an indoor movie theater, multiple playgrounds, a waterfall-fed pool and a private, nine-hole mini golf course, just to name a few. 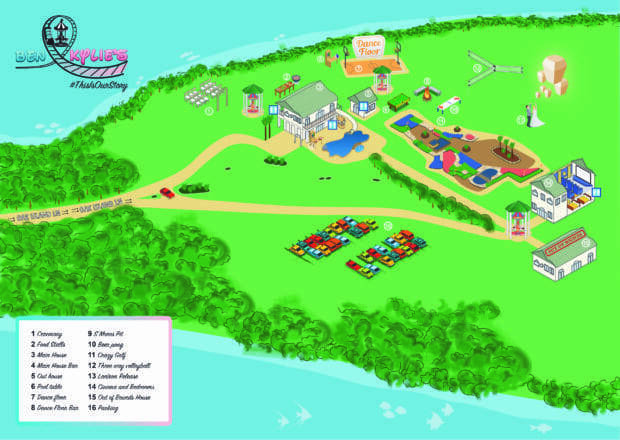 The couple utilized the space by creating their own theme park for their wedding, and even had “park maps” for guests. The wedding had an overall Disney theme, which was evident from the decor, the wedding cake, and even the attire of the bride and groom. 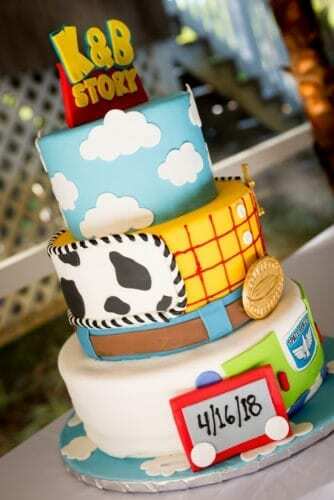 The wedding cake was themed to “Toy Story,” representing the couple’s shared last name: Story. Photo by Jonathan Rodriguez/Sublime Image Photography. 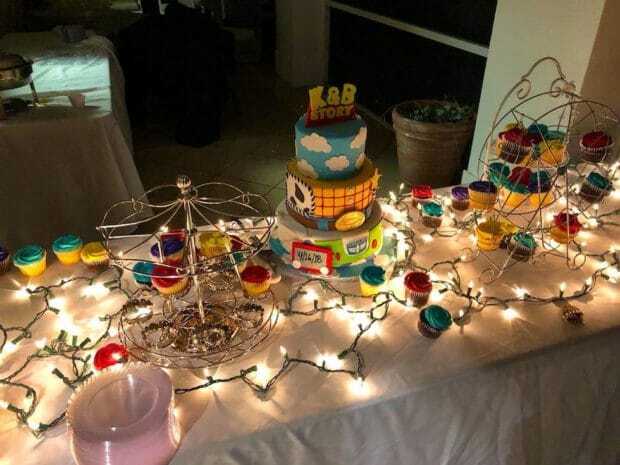 The wedding cake also included a carousel and ferris wheel of cupcakes for guests. Photo courtesy of Ben Story. 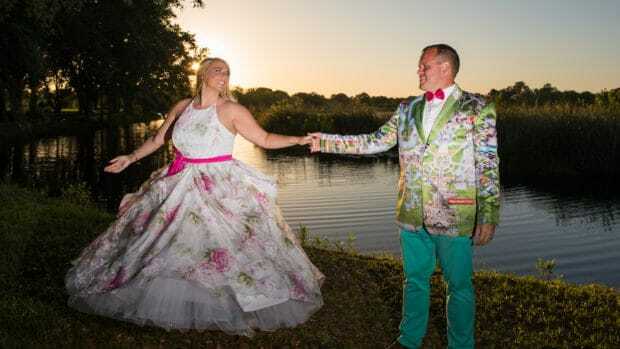 The groom wore a blazer depicting the park map for Magic Kingdom at Walt Disney World Resort, while the bride kept her Disney influence to her bouquet, which was made of Disney park maps folded into flowers with Mickey head-shaped pins. 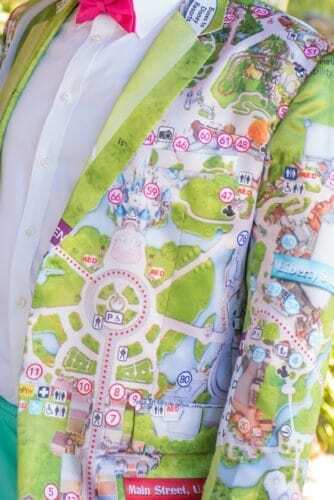 The groom’s jacket was decorated with the complete map for Magic Kingdom. Photo by Jonathan Rodriguez/Sublime Image Photography. 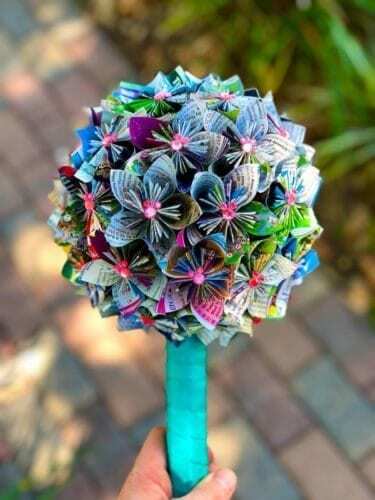 The bride’s bouquet was made up of different park maps folded into flowers, and held together with Mickey head pins. Photo courtesy of Ben Story. 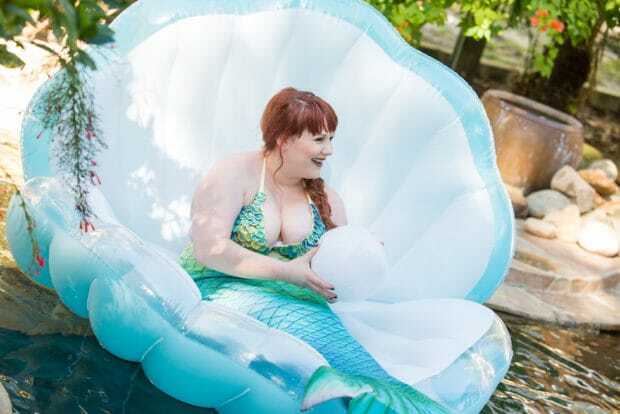 The reception included a “real” mermaid floating in her shell around the pool. Photo by Jonathan Rodriguez/Sublime Image Photography. The reception hosted multiple fun activities and snacks for guests, including a photo booth, miniature golf, caricature artists, a s’mores pit, nitrogen ice cream, cotton candy, popcorn and more. A mermaid could even be found floating in the waterfall-fed pool. The couple got to end their first newlywed night together with a private fireworks show. Photo by Jonathan Rodriguez/Sublime Image Photography. 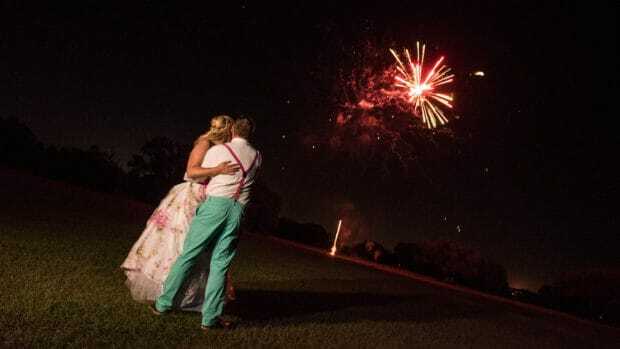 The newlyweds closed out their special day in true Disney Parks style, with their own private fireworks show for the wedding party and their guests. We wish the best of luck to these newlyweds! 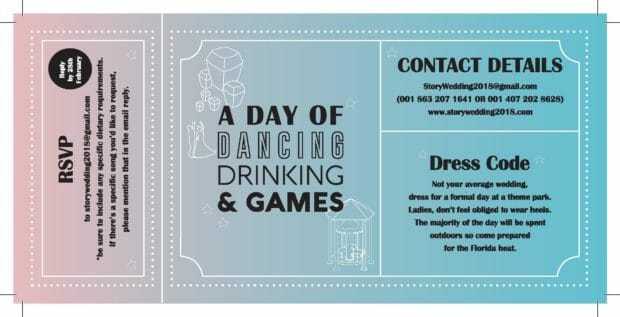 Mr. and Mrs. Story definitely know how to do a theme park wedding right. Check out their wedding website here.